This Recipe Is A Busy Mom’s Best Friend! I bet there are quite a few people out there, wondering about the exact same thing I am; Just what am I going to do with all that leftover turkey? You’re getting a little bored of those sandwiches already, aren’t you? No need to worry, I did some detective work for you and found this excellent turkey casserole recipe. And even if you have managed to gobble up all that turkey, you can still try this one. Just use chicken instead! As if this wasn’t a great enough casserole already, let me take it up a notch and tell you it’s also a one-pot-recipe! Yee-haw! I don’t know anyone who enjoys all that crazy cleanup in the kitchen after a delicious meal, when you’d really just like to sit back and have a glass of wine. Well, now you can! This is one of those recipes that I will never let go of my hands. Quick Tip: Add your favorite frozen vegetables to this dish! This dish right here will make you famous with your little ones. Think of the perfect ooey, gooey mac and cheese dish. I’m thinking something like Cracker Barrel’s or Panera Bread’s. Both have big shell pasta and multiple cheeses melted into it. My favorite combination is Colby Jack and Cheddar. These two bring the perfect amount of saltiness and tanginess to a mac and cheese. Add a little pepper over the top and you’re good to go. Now, just about every kid I know will eat a dish of mac and cheese, but how hard is it to get them to eat the protein on their dish? My neighbor Anne is always telling me about her daily struggles on getting her kids to eat the dish she sets before them. They will always load up on the bread or mashed potato or pasta, but leave the chicken or beef she has prepared for them. She has tried everything, but they just won’t eat it. That is when we thought of chopping up the chicken and hiding it in the mac and cheese! It’ll make it harder for them to leave it, and they’d likely just take one big bite and have both pasta and chicken in their fork. Photo and recipe courtesy of Eating on a Dime. At Last, The Secret To Rich and Cheesy Is Revealed! You’ve enjoyed crepes with your morning cup of coffee, and even as a sweet dessert, but have you had them in an entrée? Impress your family with this creamy combination of flavors and textures, and deviate from your normal dinner routine. All you need is 1 hour to prepare this casserole and it is worth every minute. This stacked chicken crepe dish is loaded with mushrooms, chicken, spinach, and let’s not forget the cheese! Make this for any get-together or pot-luck and instantly please the masses. CONTINUE TO THE NEXT PAGE FOR A LIST OF INGREDIENTS. Quick Tip: Always spray the baking dish with Pam spray to avoid sticking! Well This is ONE Clever way to Cook Chicken Parmesan! Everyone loves a great dish of chicken parmigiana, but what about when it’s baked into a comforting casserole? Well that leads to everything…..yum! 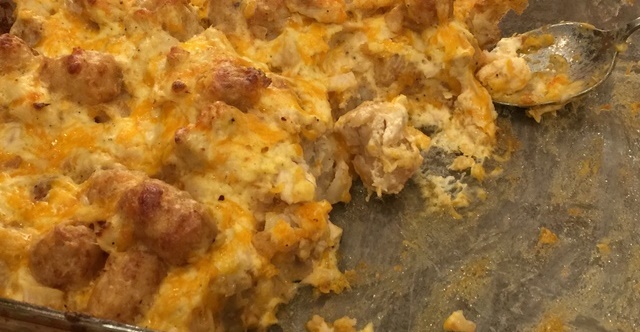 This recipe serves about 6-8 people and is virtually a baked masterpiece. When you want some spicy filet of chicken without all the mess, consider this casserole dish, at the top of your list! A Creamy Crispy Casserole That Won’t Last on Your Table! What’s cheesy, thick, creamy, and breaded all over? This recipe and your next dinner solution! Just like a thick chicken noodle soup, this casserole is perfect for a mid-week meal. This recipe serves 8 and is ready in about 45 minutes. These types of casseroles make for great leftover as well. Pack the remaining casserole into to-go containers, for an easy, on-the-go lunch. This is a great weeknight recipe because it’s simple, yet filling, and the left overs can make great lunches (assuming there are any at all). This dish yields 4-8 servings and is ready in under an hour. Packed with protein and veggies, it’s a great dish to keep you going midweek, not to mention it makes mouths happy!